Today (20 February), PubMatic released its fourth Quarterly Mobile Index (QMI) report of 2017, providing insight into the mobile advertising industry for both publishers and advertisers during last year’s final quarter. 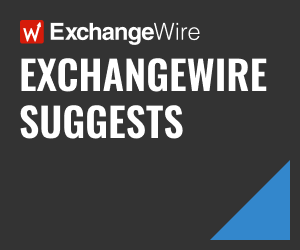 Key highlights include the global opportunity represented for mobile video, and a robust premium on eCPMs from mobile PMPs versus the open marketplace. By analysing the flow of digital impressions through PubMatic’s platform, the report identified six key trends. 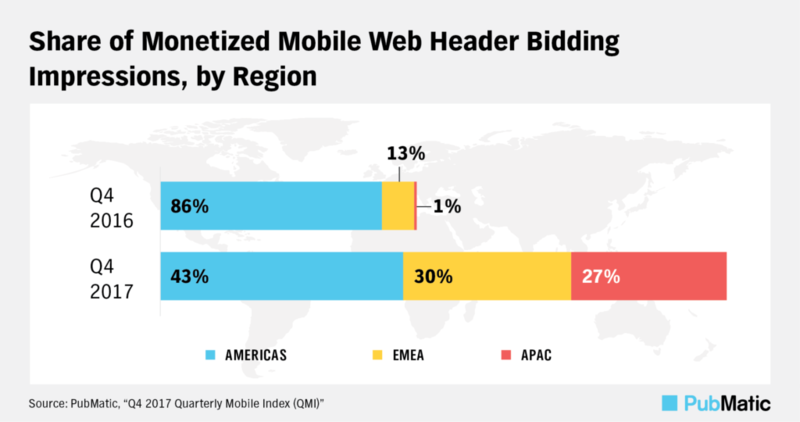 Mobile web header bidding began to reach maturity, with mobile web eCPMs growing, as well as strong rises in mobile volume being identified in APAC and EMEA, all underpinned by a focus on quality. PubMatic saw a 155% rise in eCPMs in mobile PMPs, versus mobile open exchanges, as advertisers sought quality, premium inventory, amongst continued concerns over brand safety, ad fraud, and viewability in 2017. As well as a rise in eCPMs, PMP impression volume on mobile grew 37% in Q4 2017, from the previous year, with the share of mobile versus desktop doubling, from 11% in Q4 2016, to 22% in Q4 2017. These trends are in line with a study from the CMO Council and Dow Jones in September 2017, which found that 72% of CMOs polled worldwide were facing management pressure to secure and gain more control over advertising. Mobile web header bidding reached a penetration of 72% among the top 1000 U.S. publishers in December 2017. Client-side solutions remain the most popular, with a 41.6% adoption rate. However, with header bidding expertise on the up, the adoption rate of hybrid solutions, offering both client- and server-side integrations, increased from 13.6% to 20.7% between September and December 2017. PubMatic saw a 162% rise year-on-year in the volume of impressions monetised through its hybrid OpenWrap header bidding technology globally. 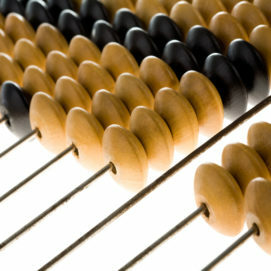 Mobile web in particular saw a growth of 244%. While header bidding adoption is still on the rise, the growth rates previously seen are starting to slow; especially in mobile web, which saw astronomic year-on-year growth rates of 1,182% in the first quarter of 2017, slowing to a still strong rate of 121% growth rate in Q4 2017, versus the same period in 2016. Regionally, APAC saw the fastest full year expansion, rising 43x year-on-year, versus 4x growth in EMEA, and only 1.5x rise in volumes in the Americas, where the technology is much more mature. 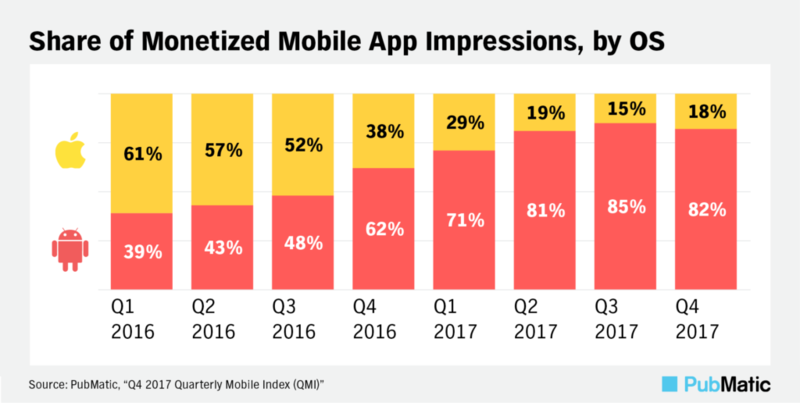 Mobile app impression volume saw a 121% year-on-year increase in 2017, with apps taking the lead across the year, with a 65% to 35% impression split between mobile app and mobile web, versus 37% to 63%, respectively, in 2016. The upward trend for monetised mobile app impressions likely aligns with changing consumer trends, with research showing that, globally, mobile users spent nearly three hours daily using apps in 2017. According to advertisers, in-app inventory provides lower bot fraud, greater accuracy on user data, and a better user experience for consumers, versus the mobile web environment. However, mobile web still has a valid role to play, with a greater variety of more compelling ad formats, as well as greater reach than mobile app. With the Android operating system taking an 85% global market share in 2017, versus 14.7% for iOS, impression volume was naturally skewed in the former’s favour. Android’s share of monetised mobile app impressions grew triple digits (266%) in 2017, achieving an 82% share in the fourth quarter. Android also had the edge on eCPMs in Q4 2017, earning a 1% premium over iOS in PubMatic’s platform. However, this was likely a result of advertisers seeking the greatest reach during the holiday season. Looking at 2017 in total, iOS still came out on top, earning a 12% premium over Android. Mobile programmatic video impression volume trended up on PubMatic’s platform in 2017, reaching its highest point in the fourth quarter, during the holiday shopping season. This was a resurgence following a significant pullback in Q2 2017, after the YouTube scandal hit at the end of Q1. Twenty-four percent of video ad impressions in PubMatic’s platform were monetised through mobile devices in Q4 2017, versus 16% during the same period in 2016. Globally, the Americas saw its total share of video impressions drop from 80% to 51% in the final quarter, versus Q4 2016, as mobile video became more widely available in other regions. EMEA saw a significant 132% increase in its global share, rising to 44% versus 19% in Q4 2016. APAC, while starting from a much lower base of only 1%, also saw its global share increase in triple digits: 500% to achieve a global share of 6% of monetised video impressions. While desktop eCPMs are still higher for video impressions, the gap is closing, with desktop only earning a 5% eCPM premium over mobile in Q4 2017, compared with 12% in the equivalent period in 2016. 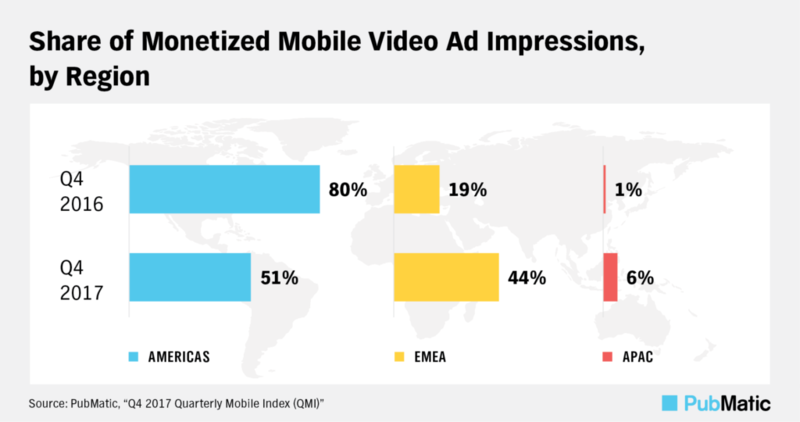 For the first time in 2017, all regions worldwide represented minority portions of monetised mobile impressions. Strong growth in EMEA and APAC helped to compensate for a slight decline in the Americas, resulting in global growth of 26%. In the Americas, lower impression volume was counterbalanced with higher eCPMs, as focus shifted towards premium publisher partnerships. 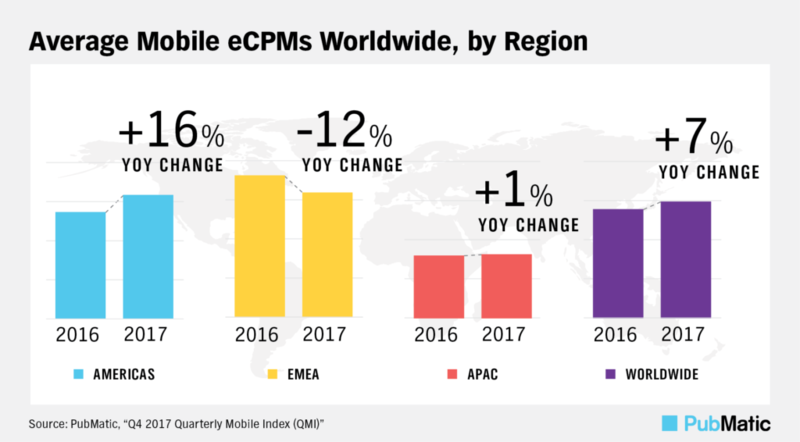 It was the 16% increase in mobile eCPMs in the Americas, which buoyed the global results, with a 7% year-on-year growth, despite a 12% decline in EMEA and only a 1% increase in APAC. Despite the decline in EMEA, the region still saw the highest eCPMs globally, closely followed by the Americas. A shift towards quality definitely shaped 2017, as growth continued, alongside a strong focus on mitigating risk, pushing transparency, and advertisers gaining control. The latest Quarterly Mobile Index report, issued quarterly by PubMatic, is available to download now.